Darke County Center for the Arts will present Mermaid Theatre of Nova Scotia’s production of The Rainbow Fish at Henry St. Clair Memorial Hall in Greenville on Sunday, February 10 at 2 p.m.
Darke County Center for the Arts will present Mermaid Theatre of Nova Scotia’s production of The Rainbow Fish at Henry St. Clair Memorial Hall in Greenville on Sunday, February 10 at 2 p.m. “This classic children’s book about the beautiful fish who learned that by sharing his most prized possession he could earn friends and gain happiness won international acclaim when it was published in 1992, and has only grown in popularity ever since,” stated DCCA Artistic Director Keith Rawlins. “Even the youngest children will be enchanted by this delightful show, which will also charm their parents and grandparents,” Mr. Rawlins concluded. An original stage adaptation of the colorful tale by Marcus Pfister as well as two of the author’s companion pieces, Mermaid Theatre’s production utilizes innovative puppetry, striking scenic effects, and evocative original music to retell the beloved stories of the initial award-winning book as well as Rainbow Fish Discovers the Deep Sea, revealing further deep sea adventures of the sparkling fish of the title, and Opposites, a work cleverly introducing concepts such as up and down, in and out, and the most satisfying opposite of all, give and take. 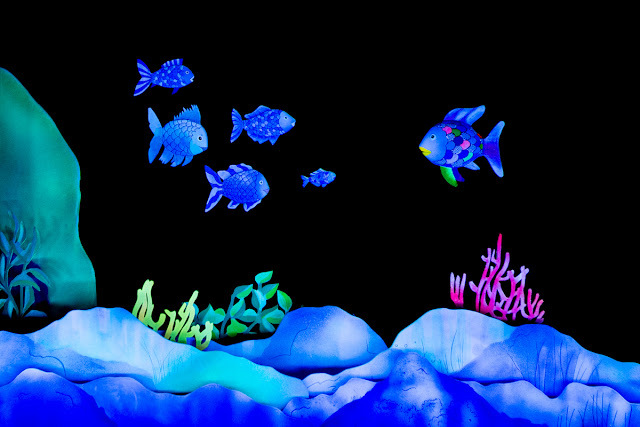 Mermaid Theatre is known for its commitment to producing good theatre that is entertaining, informative and stimulating to all the senses while encouraging literacy and generating enthusiasm for the art of reading. Sponsors of DCCA’s Family Theatre Series are Dayton Power & Light Company Foundation, Second National Bank, Greenville Federal, James Steyer Fund of Darke County Foundation, Edison State Community College, Gordon Orthodontics, Jordan Insurance Agency, Wayne Healthcare, Greenville Rotary Club and Family Health. The series also receives support from the Jean Louise Thieme Fund of the Darke County Foundation and DCCA memberships. This performance is made possible in part by state tax dollars allocated by the Ohio Legislature to the Ohio Arts Council, a state agency that funds and supports quality arts experience to strengthen Ohio communities culturally, educationally, and economically. DCCA also receives operating support from the Harry D. and Esther Stephens Memorial as well as funding from the Ketrow Foundation, Lydia E. Schaurer Memorial Trust Fund, and the John R. and Miriam H. Knick Fund of Darke County Foundation. Tickets for The Rainbow Fish cost just $5, and may be obtained by contacting DCCA at 937-547-0908 or dcca@darkecountyarts.org; tickets are available online at www.darkecountyarts.org and will also be sold at Greenville Public Library, Readmore’s Hallmark and Darke County Welcome Center in downtown Greenville, Worch Memorial Library in Versailles, and will be available at the door if any remain by showtime.